Articles / Social Media Management / I Tried Hootsuite's "5-Day Plan for Increasing Twitter Engagement"
I Tried Hootsuite's "5-Day Plan for Increasing Twitter Engagement"
Social media is probably an essential part of your marketing plan whether you’re at a large corporation or startup or SMB. But managing a social media account can be intense and time-consuming. Fortunately, there are great tools like Hootsuite, Sprout Social, Buffer & Tweetdeck to make social media management a lot easier. At Stacklist, the majority of startup founders report using a social media management tool to help them manage and optimize their posts. The most popular tool? Hootsuite. Nearly 1 in 4 founders on Stacklist report using Hootsuite. 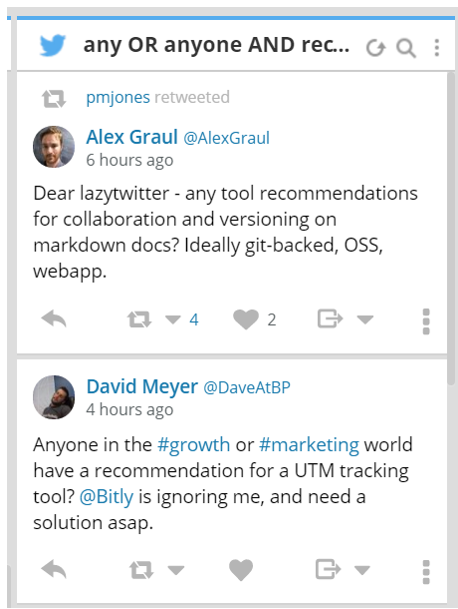 At Stacklist, our team uses Hootsuite for Twitter posting and we’re happy with it. We use Twitter aggressively to get information about helpful tools out to founders and startup teams; Hootsuite is critical in this process. But we were sensing some monotony in our social media strategy and execution and wanted a refresh. So, recently, I decided to try out Hootsuite’s “5-Day Plan for Increasing Twitter Engagement.” You can download it by filling out the form here. So how did it go? All key metrics were up. Here’s more about our experience. Hootsuite’s task for the 1st day of their 5-day plan was to create 3 lists, reflecting 3 types of accounts or people whom you think will value and engage well with your brand. Hootsuite’s recommended framework was (1) loyal customers (2) influencers and (3) press & potential partners. 2. “Founders/CEOs” was a list full of founders and CEOs (didn’t see that coming, did you?). We want to stay tapped into this group because, not only do CEOs & founders contribute thousands of insights and reviews to Stacklist, but we also need to stay tapped into questions and comments founder might have about their business tools via twitter. shoutout to the folks who fav my tweets but don’t return my texts! Hootsuite lets you turn the lists into streams that show up for easy viewing in your Hootsuite dashboard. This was pretty cool. I used to only use Hootsuite to schedule tweets, but now I have one place to see every tweet we schedule, as well as tweets from important accounts. Hootsuite’s step for Day 2 is all about providing value by initiating conversations with people whom you can help with your expertise. The key to this is setting up searches for questions you want to answer; to do this on Hootsuite, you create a stream based on AND and OR functions for keywords. And you can get as granular as you want. 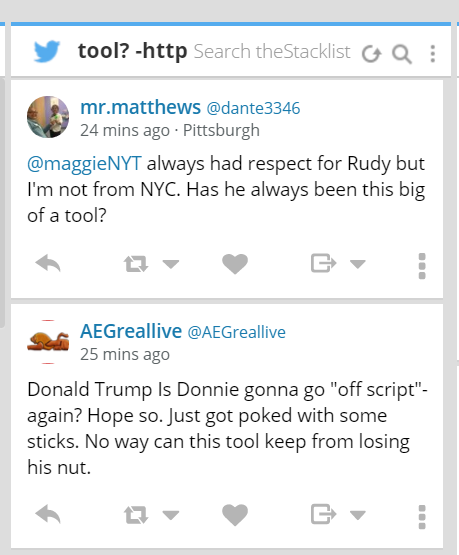 Since we know a lot about business tools, our first stream for this targeted search was for anyone mentioning tools and asking a question. So we cast a wide net and built a “tool?” stream. Most of what showed up in this stream was a lot of people calling other people tools. Or asking who the biggest tool was. Spoiler alert: It’s usually someone in government. Or someone’s friend. I quickly identified someone who asked about collaboration tools with a remote team – and gave him some advice. The tweets that show up in this stream come at a slower volume than in other streams but they yield much higher quality engagement with people who need the advice we provide. Day 3 of the plan is to use visual content to increase engagement. Using GIFs, photos, videos and Vines to offer a variety of content and make your Twitter profile page a bit more colorful. Besides the aesthetics--tweets with pictures have higher engagement. If you are or using your own images (or stock photos) then you have to make sure your images are the right size. This helpful infographic by makeawebsitehub.com is a great reference to make sure all of your images are the right size on any social network. You can manually resize your image using a variety of tools like MS Paint or Photoshop, or you can check out Sprout Social’s free image resizing tool Landscape. This is a great product that will resize your image (and keep it high quality) for any social network. After creating a stock of images and drafting a few tweets, I went into Hootsuite’s publisher and scheduled out tweets for the rest of the week, making sure most if not all tweets going forward contained an image. Protip: Pictures take up 24 characters, leaving 116 characters to work with after the picture is included. However, tagging a picture doesn’t take up any characters, so this is a great way to engage other Twitter accounts that are relevant to the post. The genius of a Twitter chat is that it generates intensive engagement in a short period of time around topics that are relevant to your company - not to mention, the hashtags you use can help spread the word virally that there’s a conversation happening. Here’s Hootsuite’s advice on hosting a good Twitter chat. You can also decide to host your chat using a variety of livestreaming tools now - for example, Twitter has Periscope. Instead of hosting our own Twitter Chat, Hootsuite was actually hosting their own that day about using Twitter as a customer service platform. At 3 pm ET the chat started. I introduced myself and started following the hashtag #HootChat in a Hootsuite stream and would reply to questions Hootsuite asked about social customer care. At first, the #HootChat seemed very hectic (considering they have over 7 million followers) but the participants were informative and ultimately it did seem like a good, efficient way to get important information via both Hootsuite and their community. I did notice a higher engagement rate for tweets that were part of #HootChat. After the chat though, engagement settled back down to normal. I’d say hosting a Twitter Chat is helpful if you find someone to partner/co-host/feature for the chat. That way both of you expand your audience to their followers. As a whole, the experience was helpful for finding some influencers in the marketing field and for engaging with other people in the chat. The last task for Day 5 is to use Twitter and Hootsuite to monitor brand mentions, identify cases of customers using your product for the first time and use these strategies to increase conversions. When you find someone first experiencing your product, you can engage with them further and boost the chance of them having a positive “welcome” to your brand. Depending on your business, this could take the form of, offering help and guidance or send discounts and targeted incentives. With streams set up from Day 1, it was easy to monitor brand mentions and thank users directly for sharing or mentioning us. And, on Day 5 I was happy to see our recommendation for PushBullet from one of our weekly New Tools Roundup was helpful to James. Thanks @theStacklist for another great recommendation, just started using @pushbullet to sync notification across devices. The use of streams is a great way to monitor mentions and engage with users. It’s also very helpful to see what content is performing well via shares, retweets and likes. This guide set out to help us make Twitter an active vs. passive routine. The guide was largely successful in breaking some of our patterns. The guide provides several easy ways to use Hootsuite to actively increase engagements on Twitter. 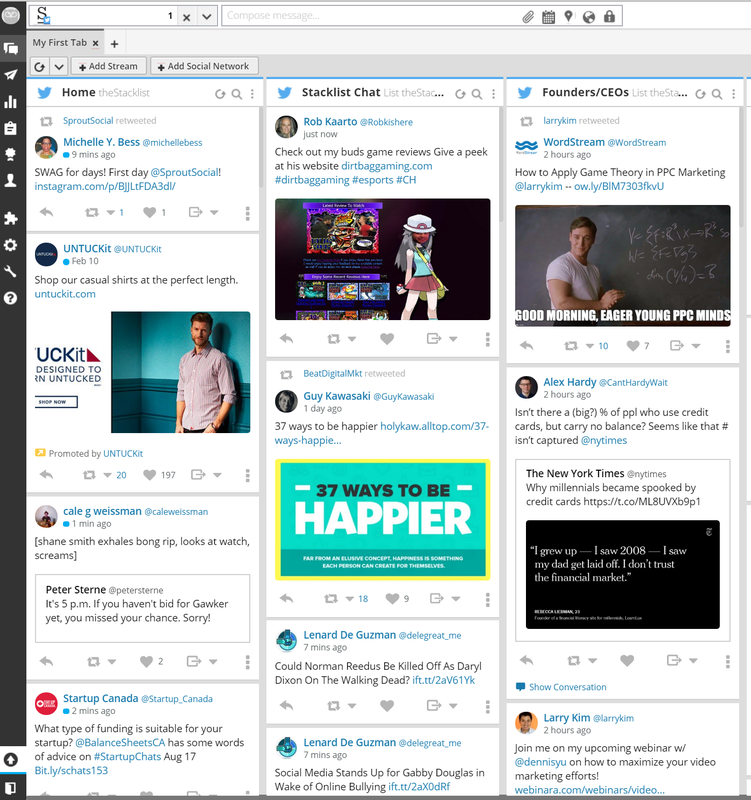 It also pushed me to keep our Hootsuite dash active on our desktop through the day - looking for any questions I could answer or interesting other people on Twitter to engage. The plan was definitely a great way to learn Hootsuite best practices. Before I was just using it to schedule tweets, in a “passive” manner. Checking streams has become a daily habit to see where I can engage with users and plan more engaging tweets. AND instead of looking at a hectic Home feed, I can look at streams for the different lists I’ve made, monitor mentions and help out people looking for specific tools. Increasing engagement is definitely just one part to a social media plan involving Twitter. By focusing on engaging content, you maintain the quality of what you put out and develop advocates for our brand. If you’re looking into social media management tools for your startup, check out our list of tools here and you can follow us on Twitter @theStacklist.